Thanks to everyone for the amazing feedback. I will try to post more often to satisfy my slightly increased reader base. 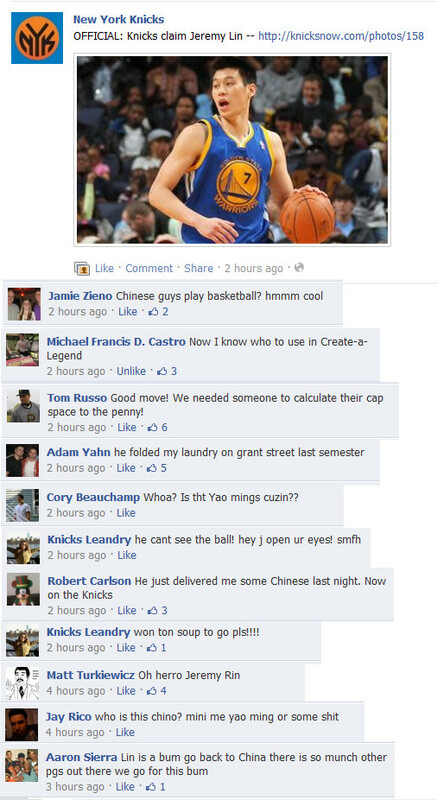 To kick things off here are some thoughts on race and basketball, featuring more Jeremy Lin talk! But, I refuse to use any more Lin puns. This thing has flown off the rails. I saw a sign at tonight’s game that said “Lindemonioum” and I could only shake my head. Jeremy’s race is obviously a talking point. No Asian American has ever done what he is doing. He has had to deal with all kinds of unfair stereotyping. I remember subtle racism from a waitress in Vermont. We were eating our pregame meal and the waitress was going around asking for our choice of main dish and a side. Jeremy got through picking his steak, but before he could name his side the waitress interrupted with “don’t worry, I know you are getting the rice!” She was dead serious. Jeremy was always good-natured about these things. We laughed about it a bit and then kept the conversation moving, but I am sure it had to bother him a little. So I didn’t make the best point. Whatever, Stockton is the all time steals leader so try to say something about that. I persisted in asking them why they are so sure of their abilities when facing their melanin deprived peers. They said that while they might not always come out on top, they would sure as hell try, “cause that’s the rule.” This slayed me for some reason. I could not believe they were trying to convince me that this “rule” actually existed. They insisted this was the case. I started to believe them after a particular sequence of events that I dealt with that season. We played the same team twice in a two week period, and I entered the game under the same circumstances each game. For garbage time. Both games went the same way. I came in expecting to just get in and get out without much happening. Maybe I’d pull a deep three just for the hell of it. But I ended up having to fight for my life defensively because the guy I was guarding suddenly decided that he needed to score at all costs. I’m talking fighting for offensive rebounds, pressuring full court to try for steals and just generally playing significantly harder than he was just a minute ago. I’m thinking, “Why the urgency? Cut me some slack. 90 seconds ago I was on the bench day dreaming about that commercial for the 24 in 1 ladder, wondering why a ladder could possibly need to be manipulated that many different ways. I don’t need to deal with your best effort right now. Just shoot a pull up jumper and be done with it.” He ended up hitting some tough shots on me both times. To make things worse, I am cool with this guy! We played together a little bit 2 years ago. Don’t get me wrong, I am all for people playing hard. It just threw me off that this guy seemed so absolutely determined to attack me during such a meaningless point in the action. After the second game I ended up hanging out a friends place, and the guy who so mercilessly went at me both times showed up. I had to ask him about it. Wait, what? Did he really just corroborate what those two clowns had said earlier. Since the original two guys were both there I called them over and had Jason repeat what he had just told me. They erupted: “told you!” I got Jason to elaborate a little, but all he could really come up with was that he felt extra motivation because of “The White Boy Rule.” There tons of flaws with this line of thinking, so I had a lot of questions. Don’t black guys play against white guys all the time? What about guys like Reggie Miller? Should I start a “Whiter Boy Rule” where I try to go extra hard against a defender if I am slightly more tan than he is? Do Europeans count as white guys? None of these inquiries were answered to my satisfaction. All he could tell me was that the rule is real and that he was sorry he had to score on me like that. Since that day I have brought this topic up to a bunch of other people who have all corroborated the rule’s existence. I have gathered that it only really applies when the guy in question is either unproven or just plain bad. Once you make a little name for yourself the rule kind of takes a back seat to playing regular basketball. I could care less about the rule, I’m just mad I hadn’t heard of it before. I could have saved myself a lot of time spent wondering why people seemed to particularly relish dunking on Shawn Bradley. found your blog through TrueHoop, great reads man. Thought the Baron Davis brother story was hilarious. Are you sure he didn’t have a “rule”? I bet he did have a “rule,” I have just never heard it verbalized.